This November, test drive more database trials to dive deeper into the human body and the body of statistics. Right now until Novemer 16th, explore the human body—inside and out—through the Visible Body databases. These visual tools allow nursing, health, and art students peel back the layers of skin to navigate the human skeleton, muscles, organ systems, and more. Each interface includes clear labels of each body part, descriptions, and the ability to download images, add notes, and draw. Rotate, move, flip, zoom in, and click on different pieces to explore further. The Visible Body offers animations for many of the systems of the body, including muscle contractions, joint movements and more. Anatomy & Physiology: This includes 12 body systems in 50 chapters, designed for core concepts of an undergraduate course in Anatomy and Physiology. 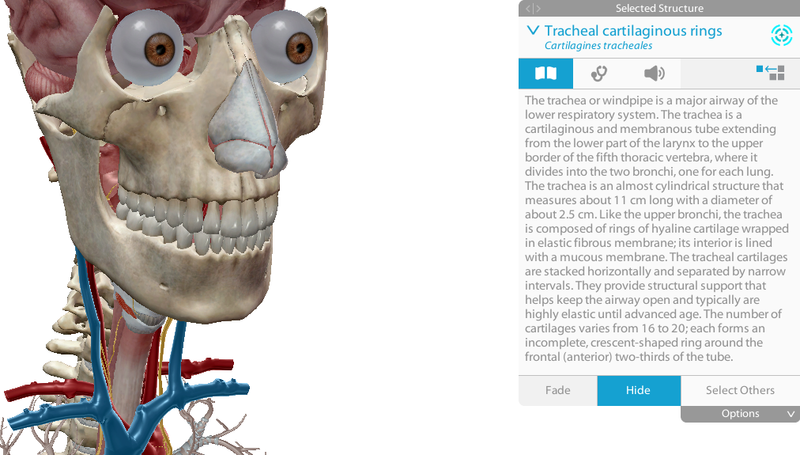 Human Anatomy Atlas: This is a 3D anatomy reference app for healthcare professionals, students, and professors. Includes dental anatomy, lab activities, dissection tools, and the Gross Anatomy Lab that mirrors what you would experience in a cadaver lab (without the smell). Muscle Premium: Ideal for orthopedic specialists, kinesiologists, practitioners of sports medicine, physical therapists, and other professionals and students of muscle and skeletal function. Includes muscle index, muscle movement videos, and a pathologies section. Physiology Animations: A video reference atlas with 3D animations that communicate core physiology and common conditions. Hurry and dissect these databases before the trial ends on November 16th! Need some statistics to shore that research paper? Test drive Sage Stats—a data download and visualization tool focused on statistical information in the United States. Includes social science data on U.S. states, counties, cities, and metropolitan statistical areas from more than 150 different government and non-government sources. 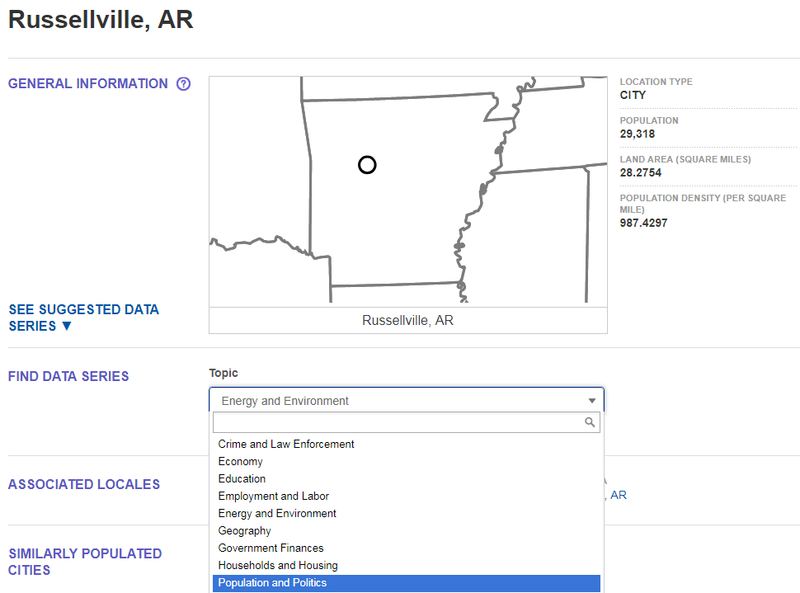 It spans topics like employment, crime, religion, and education, and includes over 400,000 datasets from sources like Woods & Poole Economics, U.S. Census, American Medical Association, and more. Search by Topic or Location. Compare two or more data series using charts. This database includes tools for citing, exporting, downloading, and sharing. There are also guides for using Sage Stats in the classroom as well as video tutorials. The trial for this resource ends on November 30th. The go-to source for the most common statistics on the American economy, demographics, education, prices, and more is the Statistical Abstract of the United States. While the Ross Pendergraft Library has this bulky tome in print at the Reference Desk, from now until November 25th, you can browse key statistics for the United States from anywhere with an internet connection. This online version is a compilation of social, political and economic statistics. 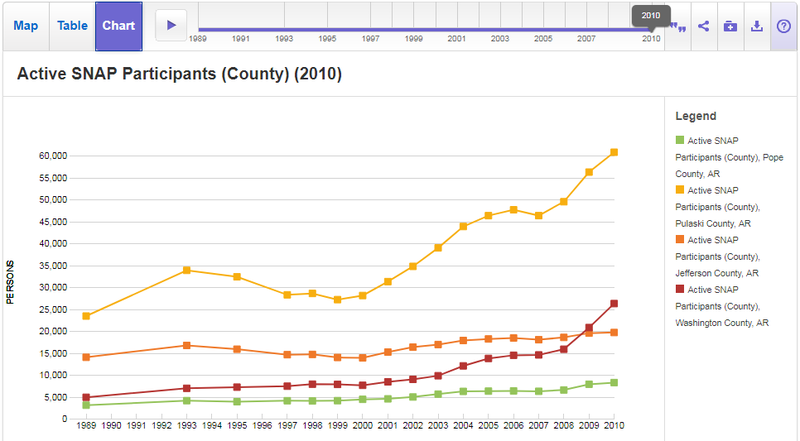 The focus is on national data, but some tables cover regions, states, cities, and comparative international statistics. It is divided into broad sections such as Population, Health and Nutrition, Education, Foreign Commerce and Aid, Prices and many others. Each table identifies the source of the data and the citation. 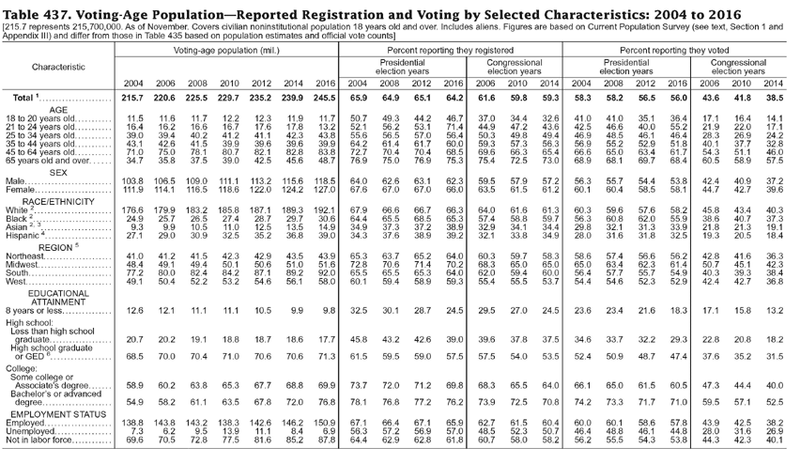 Tables can be downloaded in .xls or .pdf format. These databases will only stick around for a short while UNLESS you speak up via Ask Us. If you like these, hate these, or want to test something else, let us know! Stay tuned to Facebook, Twitter, and Instagram for more news and database trials in the future. From now until Dec. 14, take a look at the best resource for finding the right test and testing instruments for your research: Mental Measurements Yearbook with Tests in Print. This online resource contains a bibliography to all known commercially available English-language tests currently in print. It also features full-text reviews for more than 13,000 tests in psychology, business, education, and leadership. This is the most comprehensive, interdisciplinary reference tool for any researcher interested in tests, measurement, and assessment. To get started, search the database by keyword, test name, test category, purpose, and more. Results can be limited by whether or not a review is available, subject, date of publication, and publisher. Each entry will feature a description of the test, prices, scores, population, purpose, and—in most cases—a comprehensive review of the test to help you determine its effectiveness, uses, and potential pitfalls. Currently, the library has Mental Measurements Yearbook and Tests in Print in book form in the Reference Collection. 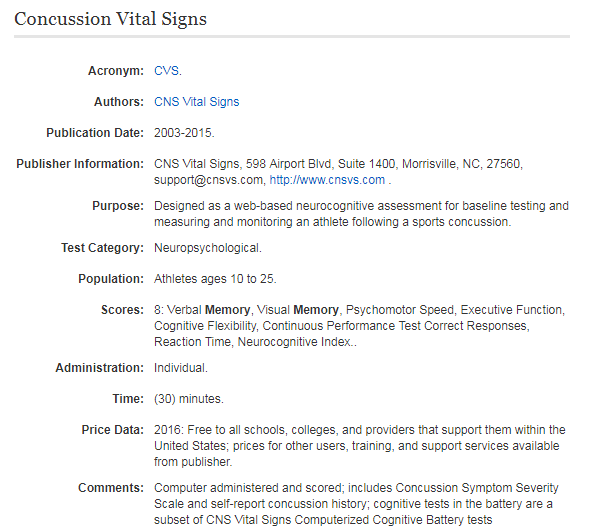 The online version pairs the listings of all Tests in Print with the reviews of all published volumes of Mental Measurements, making this a one-stop shop for comprehensive test information without ever having to leave your home or office. 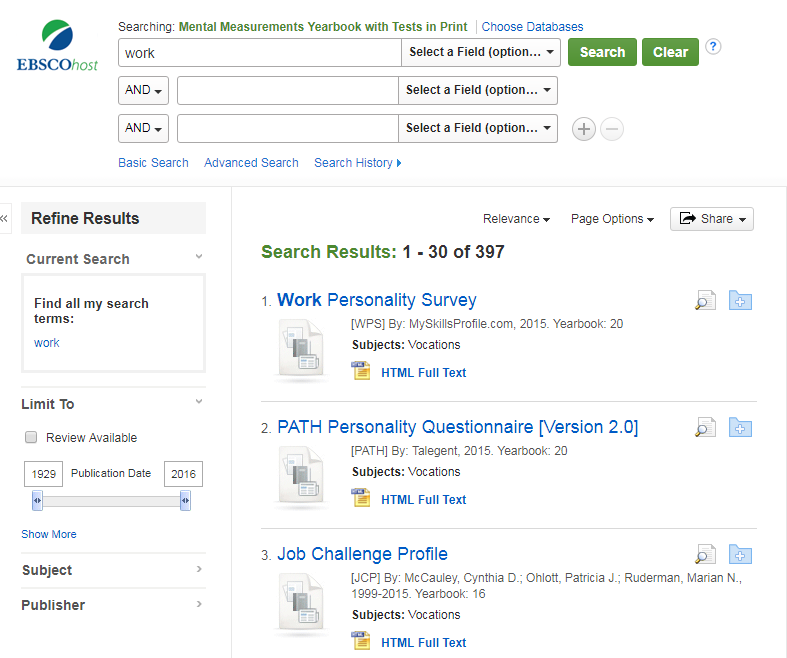 With the online version, you can search across all volumes and all 13,000 reviews with keywords and subject searches. You can also capture and import reviews and content through the familiar set of tools common to all our EBSCOhost products: save, email, permanent link, and import into Refworks. If you are not sure where to begin in your quest for tests, take a look at this research guide about Tests and Measures. It includes information about other resources for tests as well as handy hints for finding unpublished & non-commercial tests. Does Mental Measurements measure up? You be the judge! Let us know by texting us at 479-802-4876 or emailing the collection liaison for Behavioral Sciences and Business, Angela Black, at ablack9@atu.edu. Hurry, the trial ends on Dec. 14th—help us test out this potential resource! Mental Measurements Yearbook from EBSCO on Vimeo. For the month of February, we now have access to over 200 journals in the behavioral sciences published through Routledge (Taylor & Francis). These journals cover subjects like Mental Health, Social Psychology, Neuropsychology, Cognitive Psychology, Psychotherapy and Counseling, Developmental Psychology, Gerontology, Work and Organizational Psychology, Marriage and Family Therapy, Psychoanalysis, Creative Arts and Expressive Therapies, Behavioral Medicine and much more. Just look for titles with the green box for free access to latest issues and archives. Have a behavioral sciences article which you can’t find in full-text within any of our databases? Try searching the journal title in this collection. If you like what you find, let us know by contacting Angela Black, librarian for Behavioral Sciences. Hurry–you have until Feb. 28th to sample these resources before they are no longer available.